Touchscreen technology has been shown to offer advantages to older and novice users of digital products, through the relative ease of learning the interaction mechanisms and flexibility of the interface to provide explicit and contextual labelling enabling task sequences to be executed. 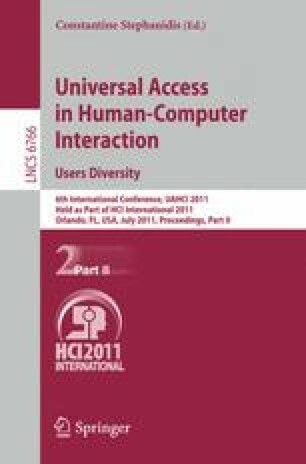 Interaction problems caused by age related changes in sensory perception, cognition and motor skills are able to be predicted using the Inclusive Design Toolkit, however this technique is unable to predict usage problems caused by lack of prior experience of digital interaction patterns. This paper reports on the ‘errors’ that older users made in a pilot study using a tablet touchscreen device in the course of completing tasks such as turning the device on, setting an alarm and sending an email. An initial classification of the problems encountered by the users is made and the potential for prediction of such errors is discussed.